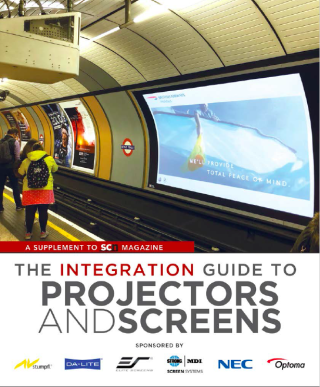 Get your free copy of The Integration Guide to Projectors and Screens! Flat-panels are flashy, no doubt, and they are coming down in price. But nothing beats the extraordinary scale, immersive potential, design flexibility, and “Wow Factor” of content projected larger than life or mapped artfully onto 3D surfaces. This SCN supplement is a deep dive into the new products shaping the projection conversation. We take a look at the latest projection solutions from companies like Da-Lite, Elite, NEC, and Optoma. SCN gets expert opinions on where projectors have the edge over flat-panel displays.